Back in the day I had several sets of Pyrex, but they were the green and gold sets. Some of it made the trip to Colorado with me 20 years ago, and some didn’t. As a mom with young children, as most of you know, you use plastic for many years. My girls are grown and gone, and John is no longer a baby so guess what – this mom has started a small collection of Pyrex again! 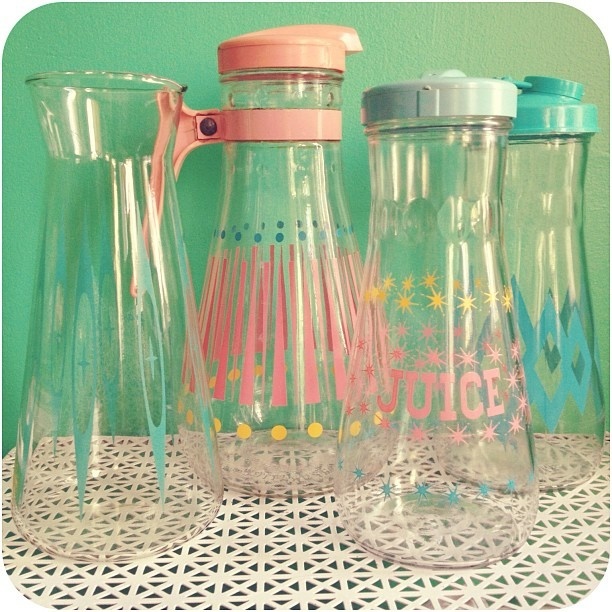 I sure would love to come across a few Pyrex pitchers and glasses like the set below. How awesome would these be in Esther (my 1960 Forester travel trailer)! I think that this is one of my favorite patterns. I just love the colors – and yes, we have a few pieces in the store! We have many complete sets, and single pieces if you’re looking to add to your collections, or start a new collection! We will be doing a few articles on Pyrex. Check back for more info on it’s history and how to bring back the luster! ps. 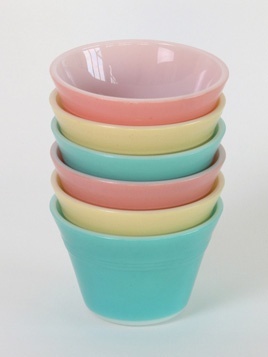 – don’t forget to share your pyrex collections pics with us!! For those of you that love the Pyrex primary colors – we have a full set again in the store. Stop by and pick it up before it is gone! If you can’t make it to the store, just call and we can hold the set for you for 24 hrs! 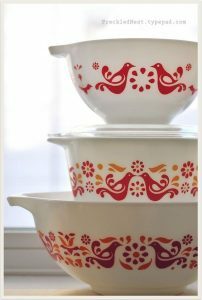 Last week I shared a little history on Pyrex being 100 years old. 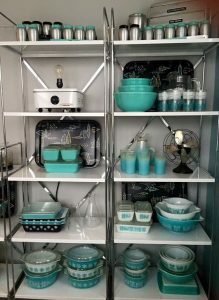 So today I though that we would share a few of our favorite Pyrex collections! This is a beautiful collection – nice mix of colors and designs, casseroles, refrigerator sets, mixing bowls & more! 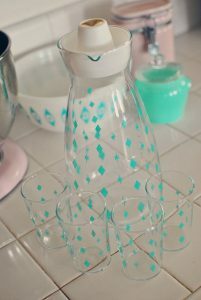 And for those of us that don’t have a large space, or a large Pyrex collection – this is adorable! I love the apron collection & matching Pyrex, along with the yellow kitchen cart. So Retro! Now I would love to find a set of these. I have never seen these in person, but would use them every day! 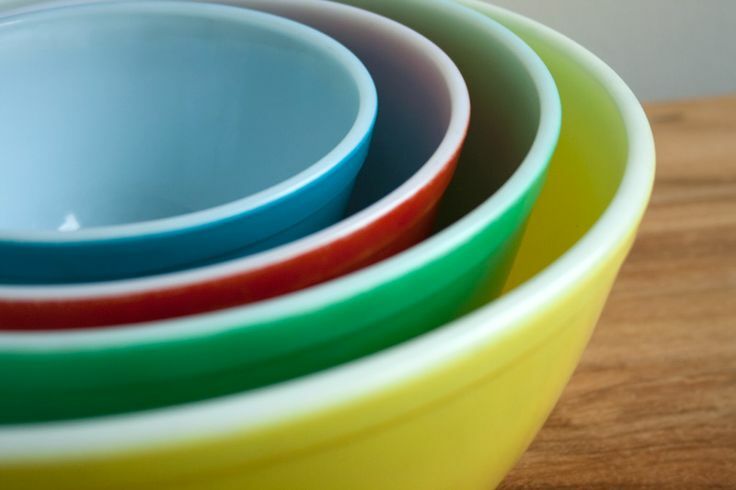 We would love to see some of your favorite Pyrex collections. Can you believe that Pyrex is 100 years old. Below is a graphic that shows a little history on Pyrex. I don’t know about you, but I LOVE all of the old colors. I am not a big fan of the clear stuff. 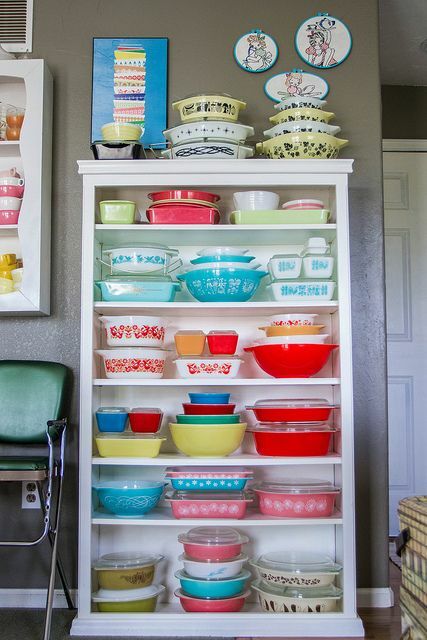 We would love to see some of your favorite Pyrex collections!